1. Cook the parsnips in boiling water for 8–10 minutes until tender. 2. Meanwhile, brush a non-stick griddle pan with olive oil. Cook the pork escalopes for 4–5 minutes on each side until browned and cooked through. Transfer to warm plates and leave to rest. 3. Drain the parsnips well then return to the pan and mash until smooth. Stir in the garam masala, dried apple, yogurt and salad onions. 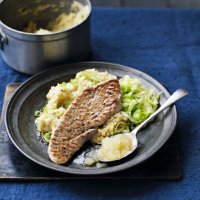 Serve with the pork steaks and a little essential Waitrose Bramley Apple Sauce, if you wish.